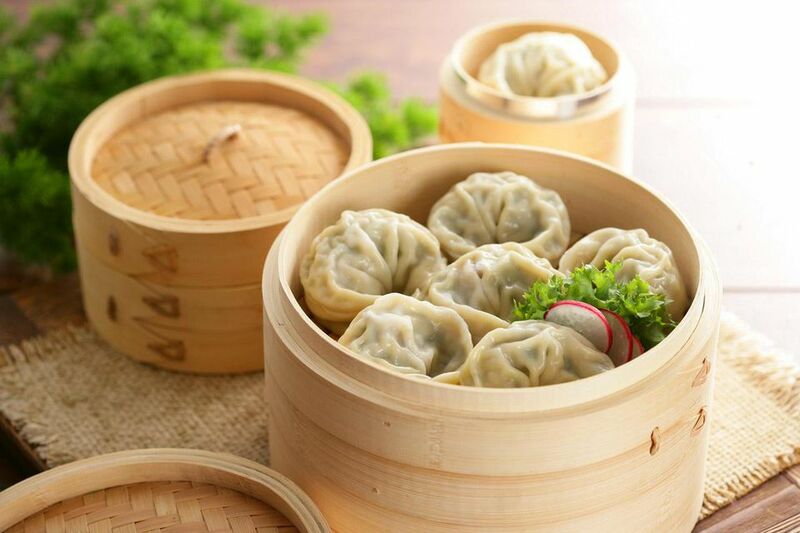 Korean dumplings, known as mandoo or mandu, are a traditional, easy-to-make traditional food that can be prepared in large quantities in advance and stored in the freezer for future use. These little dumplings are stuffed with a mixture of meat and/or vegetables and can be deep-fried, boiled, pan-fried or baked in the oven. There are almost as many variations of mandoo as there are cooks in Korea. Mandoo is often prepared by families as part of Korean Lunar New Year festivities and is considered a symbol of good luck for the coming year. In a large mixing bowl, gently combine ground beef or ground pork, onion, cabbage, tofu, and noodles. In a separate small bowl, combine garlic, sesame oil, soy sauce, salt, and pepper. Pour seasoning mixture over meat and vegetables and mix with hands to combine. Place about 1 tablespoon of filling in the center of dumpling wrapper. Dip your finger in water and wet the perimeter of half of the wrapper. Fold the wrapper in half, pressing to seal and then crimp the edges. Repeat until the filling is gone. You can steam, boil, fry, or sauté the dumplings as you wish. Serve with basic dipping sauce or a spicy sauce. If you have extra dumpling wrappers, you can just cut them into slices and use them to make noodle soup. If you want to prepare a lot of dumplings in advance, steam the dumplings, wait for them to cool, and then freeze them on a parchment-lined tray. When fully frozen, transfer them to a zip-top bag for longer storage. You can then use them anytime straight from the freezer without defrosting, whether you want to fry, sauté, steam, or use them in soup. Korean dumplings are traditionally made with a beef or pork filling, but chicken and vegetarian dumplings also are popular. Mandoo can be added to soup made with beef broth or anchovy broth (mandu guk) that also can be served with a traditional cylindrical rice cake (tteok manu guk). Versatile and delicious, mandoo are substantial enough for a main dish but also are good as snack or appetizer dishes or a mess-free lunch.